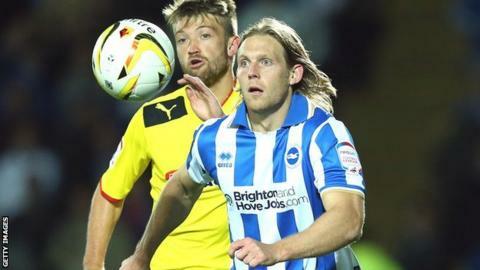 Craig Mackail-Smith scored his sixth goal in four games as Brighton beat Watford to maintain their impressive start to the league season. The Scottish international scored the only goal of the game from the penalty spot after he had been brought down in the box by Daniel Pudil. Watford could have had a couple of penalties of their own, while Fernando Forestieri hit the bar with a shot. But Gus Poyet's side held on for a fourth straight win. Albion's haul of 13 points from six matches leaves them third, level on points with second-placed Blackpool, and Hull and Cardiff who occupy fourth and fifth spot respectively. In contrast, Watford have now lost four successive matches in all competitions as Gianfranco Zola continues to endure an inconsistent start to his reign as manager. Brighton boss Poyet and Watford boss Zola are old Chelsea team-mates. The pair played together for the Stamford Bridge club from 1997 to 2001, helping Chelsea win the 1998 Cup Winners' Cup and the 2000 FA Cup. However, it was the Hornets who began this match the brighter with Mark Yeates firing wide from 25 yards and Almen Abdi also off target from just inside the area. After that, Brighton gained control of the game and would have gone into the break ahead had Mackail-Smith been more accurate with a prodded effort following a Will Buckley cross. The deadlock was broken five minutes into the second half, with Watford contributing to their own downfall as Piccoli Neuton gave the ball away on the edge of the area, allowing Mackail-Smith to nip into the box before he was brought down by Pudil. Mackail-Smith made no mistake by drilling his penalty down the middle and past home keeper Manuel Almunia. Pudil almost made amends for his side when his cross was met by the boot of Forestieri, but the crossbar denied the Argentinian forward. Watford had penalty shouts of their own when Jonathan Hogg and then Nathaniel Chalobah tumbled in the area, while Brighton could have won by more with Mackail-Smith firing just too high and Almunia saving from Dean Hammond.